By Kim Tourret, first year student, MPhil Textile Conservation. One of the reasons I chose to undertake my student work placement at the Museum of London was the chance to work with a social history collection, and as a Londoner the opportunity to work with objects that are inextricably linked to London and its history was too good to miss. An ongoing project that I was involved in was the documentation and storage of the Brian Haw collection, which was acquired by the Museum of London in 2012. The collection contains objects from the peace camp set up by Brian Haw in Parliament Square, opposite the Houses of Parliament. 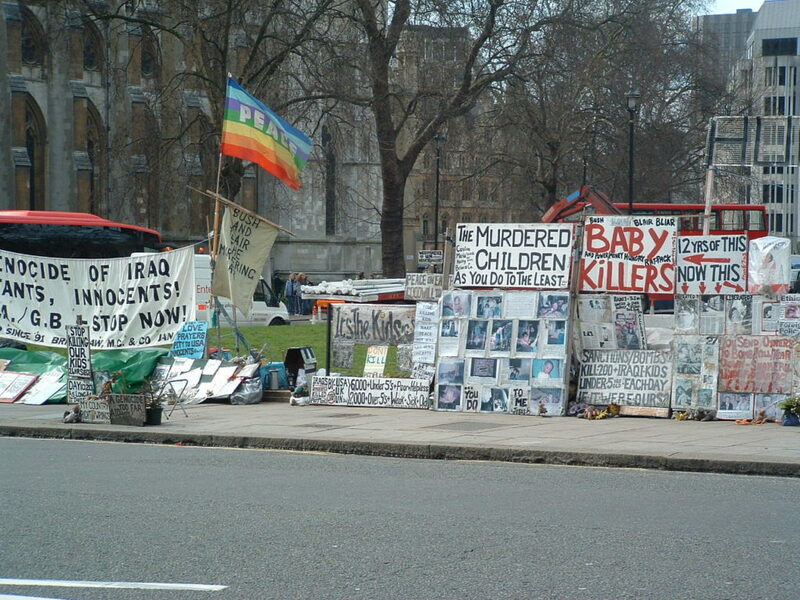 Haw set up the camp in 2001 initially in protest against UK and US foreign policy, becoming an increasingly visible and vocal opponent to both governments’ involvement in the subsequent Iraq war. In 2006 the Metropolitan Police seized Haw’s camp, citing that Haw had breached conditions of the Serious Organised Crime and Police Act 2005. 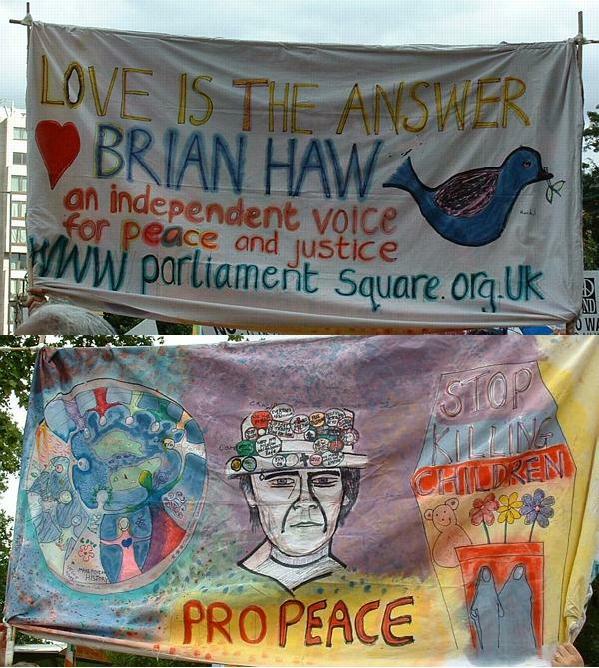 Haw was acquitted of these breaches in 2007, and continued his peace camp at Parliament Square until his death in 2011, despite a number of legal and police challenges. 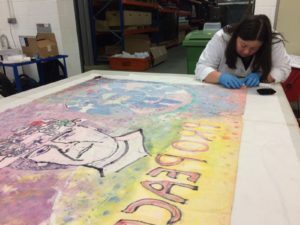 After his death, the police returned the items seized from Haw’s camp to his family, who agreed to transfer the collection to the museum. The Brian Haw peace camp © This work is licensed under a Creative Commons Attribution 2.0 Generic Licesnse. It is attributed to Laura Haddon and the original can be seen at: https://en.wikipedia.org/wiki/Brian_Haw#/media/File:Iraq_demo_in_london.jpg. 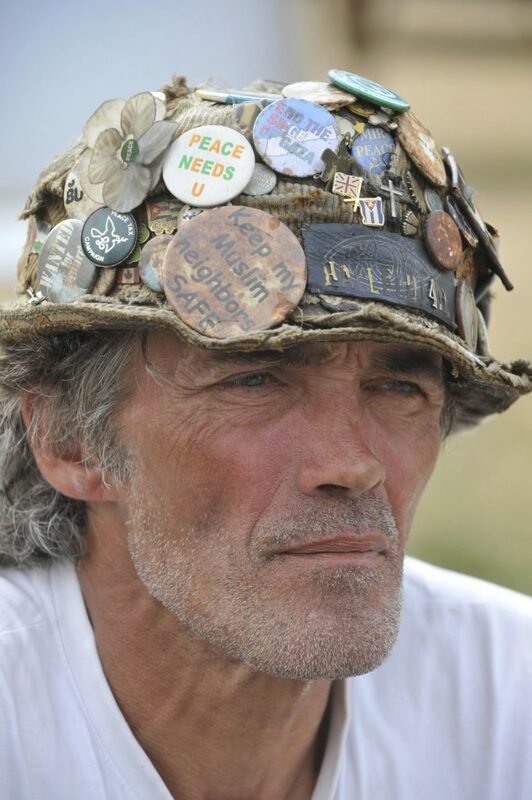 It’s a fascinating collection for many reasons, not least the political impact that the peace camp had – in 2007, Haw was voted Most Inspiring Political Figure at the Channel 4 News Awards. From a conservation perspective, the collection poses many challenges. It is hugely varied, with the 790 objects ranging from thermos flasks to teddy bears, many of which are mixed media objects with modern materials. Most of the objects are also in very poor condition, having been exposed to the British weather for several years. For example, the many corrugated plastic placards have become yellow and brittle. There are also ethical issues to be considered. Although the collection is modern and has not been excavated, one could almost consider an archaeological approach to the treatment of the objects as their significance mainly lies in their story, which means their condition (extensive soiling included) is significant in itself. 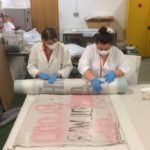 I worked with the Museum of London textile conservator, Melina Plottu, to mark and safely store over 100 textile objects within the collection. These objects include the aforementioned teddy bears, as well as tents, clothing and several large flags and banners. The most immediate issue we faced was the extensive soiling on the objects. This required us to work with lab coats and gloves at all times and masks when there was visible mould. The work was time-consuming and labour intensive. 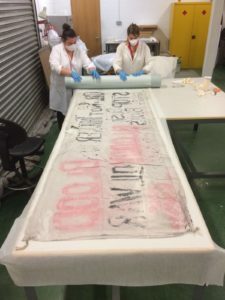 It was unfortunately not suitable for volunteers, unlike some of the non-textile objects which could be marked safely by non-specialists under supervision. This was especially applicable to the flags and banners. Aside from the obvious stitching ability needed to label the items, these larger objects require careful rolling, usually by more than one person, in order to ensure an even tension and reduce the risk of further creases being created. We were also having to find storage solutions for mixed media items. Several of the flags and banners have been attached to bamboo and wooden poles with various adhesive tapes. The risks that these present to safe storage can be mitigated in various ways. For example, the use of silicon paper to prevent the still sticky tapes from adhering to other parts of the textile when rolled. However, this all adds to the preparation time for each object. Overall, the project was hard work and surprisingly physically demanding. 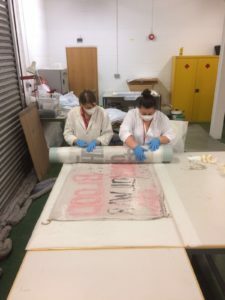 However, having not worked with large objects before, the practical experience has been invaluable as my rolling technique is improving steadily with each banner. It has been a privilege working with this collection and finding out more about Brian Haw and the peace camp that I actually used to walk past on my way to school. At the time I did not pay much attention to it and just considered it part of the scenery. I never would have imagined that I would be helping to preserve it 15 years later.